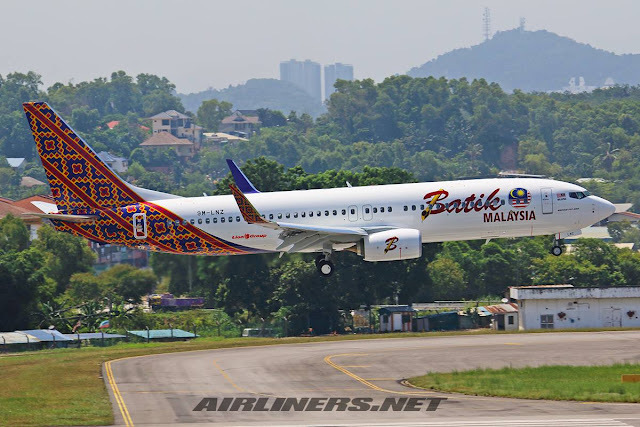 Welcome to my Trip Report on Batik Air Malaysia! The Lion Air Group - owner of Malindo decided to re-brand Malindo to Batik Air Malaysia, why? I don't have the answer but probably to reduce cost (less one company). This makes sense since both Malindo Air and Batik Air have identical cabin products. 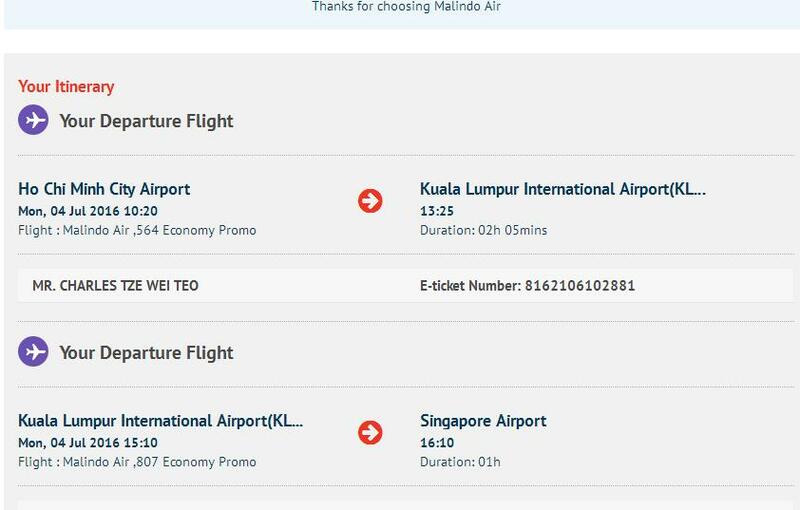 I had to decide between Malindo or Singapore Airlines to fly back home. Flying with Singapore Airlines was an attractive option because I hope to fly on a different Airbus A330 and also the flight timing was better. 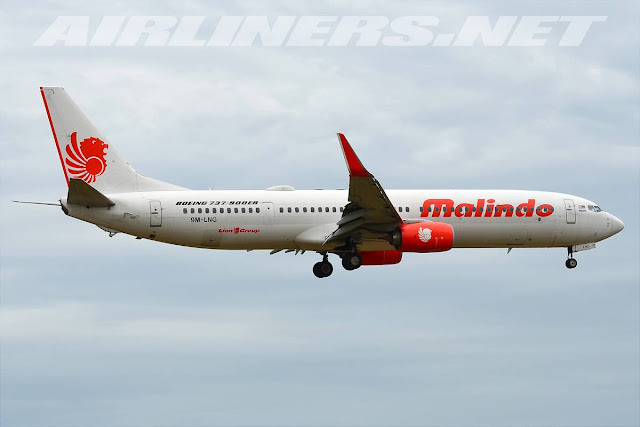 For Malindo, I like flying with the airline for its new Boeing 737 BSI interior fitted with individual Personal TV, and also get to fly on a new routing: SGN-KUL then another flight from KUL to Singapore. For me, the more flights, the better. 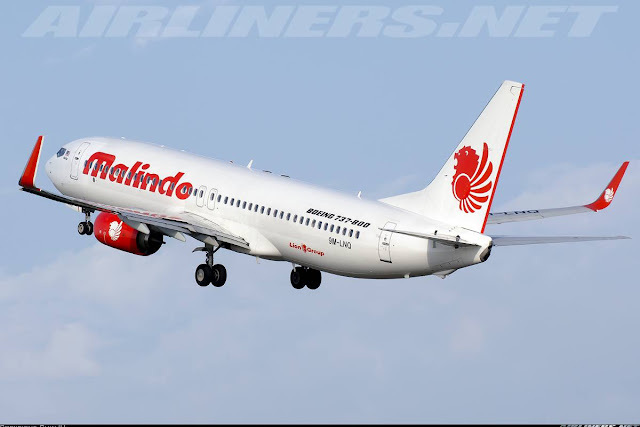 So what made me decide for Malindo in the end? Well, the pricing. 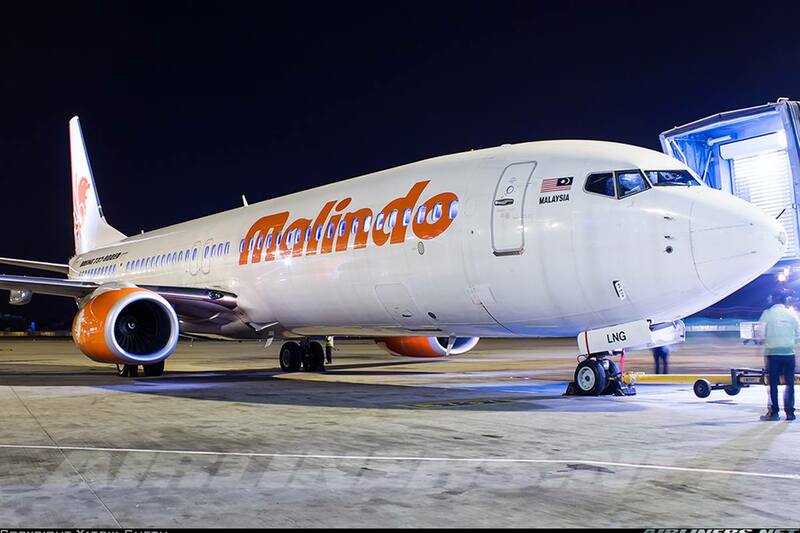 Malindo offered U.S$64 while Singapore Airlines offered U.S$117, no-brainer right? So once that was decided, I did the booking. The airline's website has changed since the last time I flew with this airline. This would be my 6th flight with Malindo, are there any difference between this and my previous flights with this carrier? Do read on to find out. When I saw only 1 seat was left, I quickly made my booking. You never know when you get this offer again. My favourite part, that is to make my seat selection but I didn't chose my seat during the booking as I didn't want to pay for the seats. For this price, it is certainly not worth it. It was fast and easy and you don't have to pay for selecting the seats when doing the check-in. Check in starts 48 hours before departure. How do you tell the difference between the Boeing 737-800 and -900ER seat map? If row 26 is blocked out (emergency row), that means it's the Boeing 737-900ER. Once that was done, I could relax and enjoy the last 2 days in Ho Chi Minh. German sausages - it was delicious! For breakfast the following day, pancakes! The 10 days in Ho Chi Minh City ended too quickly for my liking, it was time to return home. Flight was at 10.25 in the morning, not very ideal but it was better than taking the 7 a.m or 8 a.m direct flight back home. Woke up around 7 a.m. Got my stuff ready as usual and took the taxi to the airport. My mistake, should have taken Uber because I know I won't be ripped off. This driver charged me an extra 10,000 dong which I checked out later I didn't have to pay. Whatever! Uber for me next time. Once at the airport, the counters were opened and I went to check in my luggage and collect my boarding pass. I was able to collect the boarding pass for the KUL - SIN sector, so all went smoothly. Did a quick check on my ride, I was pleased to see 9M-LNJ - a new addition to my flight logbook was on the way there to transport me to Kuala Lumpur. That's what I prefer to be able to roam around before boarding. An advantage over Changi and Kuala Lumpur Airport. Same cabin (comparing to my previous flights with this airline), but here are the photos anyway. These seats put some of the full service airlines' business class on the A320/B737 to shame really. I have tried out this seat product before on Batik Air (Identical cabin products), you can check out my trip report of it over here. Legroom space is good enough for medium haul routes. The best thing, to have the seat beside mine vacant. This flight ended up to be quite empty. Around 30-40% full with most seats at the vacant. You have to use your own earpiece as its not provided in Economy Class. Charging your phone is allowed at this time. For the bulkhead row, the monitor screen is in front which I prefer. See how empty the rear rows, I could have sat at this row and convert it to a mini bed. Few more shots of the cabin, I won't go much into details since this has been covered before. You can check out my previous trip report on this airline over here. Windowless seat, probably the worst seat on this aircraft! The airline used to sell hot meals, not any more, it sells just light snacks. The plan for this airline is to convert into a full service airline, competing directly with Malaysia Airlines. I still prefer to have this system over Wifi. Using our own devices for online streaming can waste a bit of battery and even if you charge using the usb port, it is slower than normal charging. You can check out my online streaming experience with Philippines Airlines trip report over here. For Malindo to offer this on regional routes and the price you pay for the ticket is worth it. Service was similar to my Vietnam Airlines experience, not so friendly set of crew waiting at their positions and a couple of them were looking elsewhere when I was making my way to the seat. For the rest of the flight, they did their job but lack of warmth and friendliness, just feel that they couldn't wait to finish their work. Aircraft pushed back on time and we were soon our way. Take off was powerful and was smooth for most parts of the flight. In-flight entertainment system was available but the passengers in Economy Class has to use their own earpiece. I was pleasantly surprised with the light snack and complimentary drink, it looks like the airline has already taken a step further to become a full service airline. Maybe a full meal service might be served next time on this route. For the rest of the flight, it was uneventful. A Vietnamese lady asked me for help about Kuala Lumpur and for the rest of the flight, I did just that and my flight ended faster than I would have like. Once the aircraft reached the gate, I made the way out with the crew looking elsewhere once again. Service? Nah, disappointing to say the least. On the runway now, time to roll! Once I got off the aircraft, I went to the monitor screen to check for my connecting flight's status. 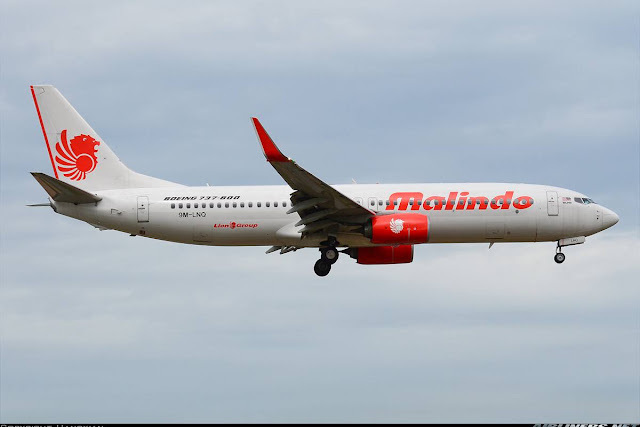 Malindo Air used to operate from KLIA2 and since March 2016, it has been operating out of KLIA1. Malindo has a few aircraft parking at the gate , but they were heading elsewhere. My aircraft was still flying from somewhere, later on I found out it was coming in from Kota Kinabalu. I had some time to kill so went to the Starbucks. A couple of passengers were holding up the queue, but fortunately the staff opened up another counter and my turn came not too long after. Unlike the Starbucks back home, the wifi password can only be used on one electronic device and is listed on the receipt. The airport WiFi signal is not available at this part of the terminal. At this point, the aircraft had not arrived. I check out Flightradar24 and 3 of the airline's Boeing 737-800. LNQ, LCC (Batik Malaysia livery) and LNU (I think), I was hoping for LCC but LNQ turned up at my gate and not surprisingly our flight was delay due to its late arrival. Disembarking! It was overall a good experience on the Boeing Sky Interior's 737s. Pity the in-flight service from the crew on both flights was less than impressive. Do you notice the difference between this and the old system? What's available on this IFE system? Even on this short flight, the IFE system was available for us though it didn't last long due to the duration of the flight. We sat the gate for a while, not sure the cause of the delay and the worst thing is we were not kept updated. The cabin crew welcome us on board, they were slightly better then the previous crew. Not fantastic but professional at least. The flight purser's announcement included an apology for the delay due to the late arrival of the aircraft but nothing was said about the ground delay. We were held up for 25 minutes on the ground even though we were ready after 15 minutes. Nevertheless, we pushed back and taxied to runway 14R for departure. Take off was powerful and the weather was even better over here than in Ho Chi Minh. The ride was around an hour and we were placed on holding pattern for 2 rounds before being allowed into Singapore and then final approach to Changi Airport. During the flight, light snack and drink was given and it was done quite hurriedly. The crew distributing them had missed out on my row but fortunately she realized it later on and we were given our share. No pressure from them to finish off our drink and snack, that's the good thing at least. Before descending, the Captain finally made his announcement and updated us on our arrival and after that the rest of the flight was routine and we landed late on runway 20 Right. We disembarked at Terminal 3 and for us passengers, we had to go through another round of security before finally allowed to head for the immigration. I got a very good deal flying Malindo (Batik Air Indonesia) on the one way ticket to Singapore. 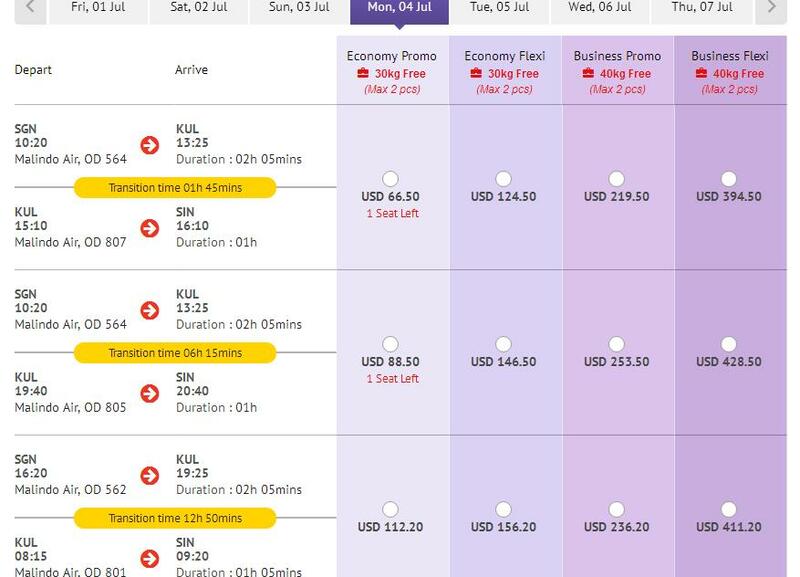 Flight timings are quite good and if you have extra cash, you enjoy business class which is cheaper than the likes of Singapore Airlines and Vietnam Airlines. 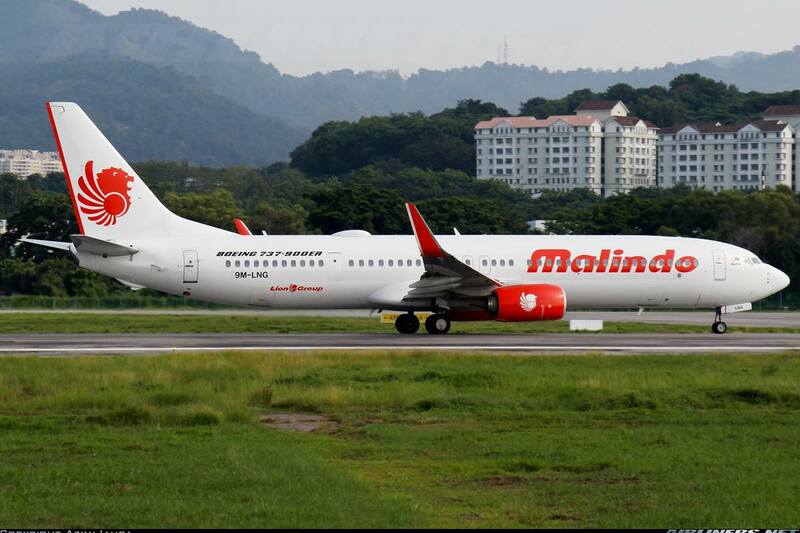 Comparing Malindo with the latter, this airline offers a better in-flight product and there is even IFE system too. In-flight service on both flights were disappointing on the overall, they are very similar to the Vietnam Airlines flights I had. So its all down to your luck what kind of crew you get. 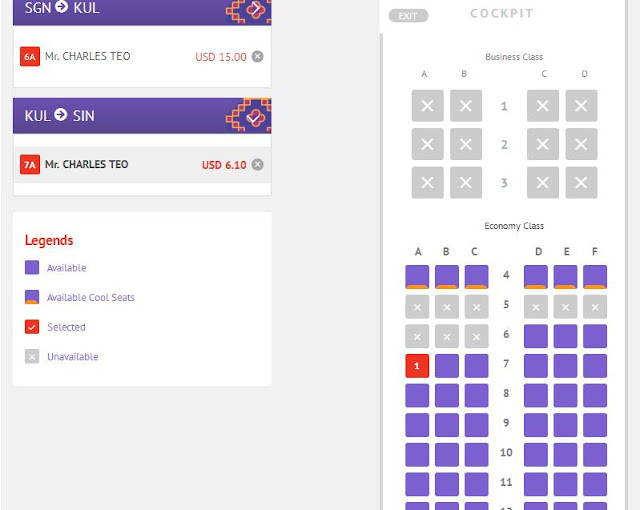 Similar to Batik Air (Indonesia), you should expect to experience a good cabin product and I don't see any reason why I should pay a lot more for business class. Even on a fully packed 737, it's still more comfortable than other airlines, for the legroom space and the comfortable seat. 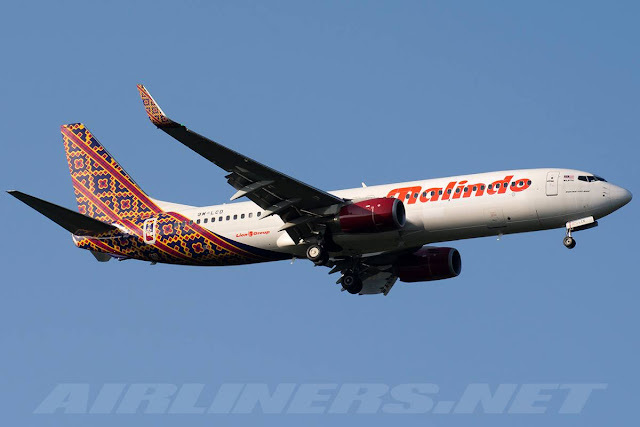 Overall, I give a thumb up for Malindo Air and like her sister Batik Air, they are worth the deal, even better than flying on its parent airline, Lion Air. Lion Air and Thai Lion Air are Low Cost Carriers and if you book with them, don't expect the same service. Malindo Air is supposed to have WiFi on their aircraft but for both flights, it wasn't available. Hope to experience it on my upcoming flight with them on the same route. That's all for this trip report! Hope you enjoy it. I understand from previous flights from KUL, the long wait for pushback is due to lack of pushback tow truck. One tow truck to serve few gates nearby. Please feel free to correct me if I am wrong. I have heard about that but I think they have resolved the issue. My recent flight departed on time.